Hope is now 13 years old. She was born in Lusaka, Zambia, and has battled the HIV epidemic her entire life. Ellen Kershaw met Hope when she was 9 years old. At the time, Hope was a vulnerable orphan, sick and malnourished, and was accustomed to surviving on the streets. Ellen and Hope instantly connected. By the end of Ellen’s time in Zambia, they were inseparable. Ellen saw her walls slowly come down, and a vulnerable, scared child hiding behind her clouded, brown eyes. Ellen and Clayton committed that summer to make life better for this child. They sponsored her through a ministry organization to provide school fees, a daily, nutritional meal, and a discipleship program that would mentor her walk with Christ. In December of 2010—only a few months after Ellen met Hope—Clayton traveled to Zambia for the first time. After years of seeing pictures, Clayton was in disbelief at the depth of poverty. They turned the corner, and heard a squeal. A flying little girl leaped into the arms of Ellen—they were finally reunited. Hope met Clayton and it was if they had known each other for a lifetime. They spent the afternoon with Hope, hearing about her past few months. No doubt, Hope looked healthier. She had been fed and therefore, her HIV medication was starting to work. But Hope still needed a safe place to call home. She was living with her aunt who was already feeding and caring for many other children in a tiny, dirt-floor shack. Hope was neglected and just trying to survive. The Kershaws realized that until she had a safe place to call home—and parents who would care for her—Hope would never be able to have the upbringing she deserved. This is how Kershaw’s Challenge began. Coming home, Clayton and Ellen had the vision of building a home for Hope and children just like her. 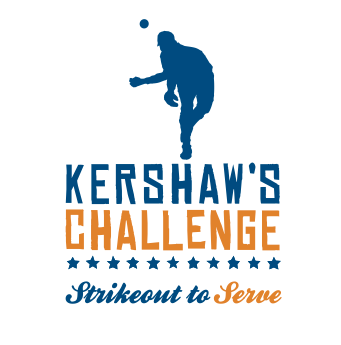 Clayton came up with the idea of “Striking Out to Serve.” In 2012, Kershaw’s Challenge expanded to serve children’s charities in Los Angeles and Dallas. In December of 2012, the first 8 children, including Hope, moved into Arise Home. For the first time, they had beds to sleep in, a loving family of brothers and sisters, nurturing house mothers to tuck them in at night, full bellies everyday, and a private school education. 2015 is an exciting new season for Kershaw’s Challenge. We will continue our work in Los Angeles, Dallas and Zambia. For the first time, we will expand our efforts into the Dominican Republic. Kershaw’s Challenge is committed to transforming the lives of children, in America, Africa and the Dominican Republic, through Jesus Christ. Our goal is to partner with organizations that are committed to this as well, and work alongside them on specific projects to make life better for children. Since 2011, Kershaw’s Challenge has given away over 1.8 million dollars to underprivileged children like Hope.